Melissa Bradley Diskin, the Atlanta scout at Brides.com, wrote a lovely piece on JetKat Design! Looking for a modern suite of wedding stationery? Kate Zimmerman of JetKat Design serves up kicky ideas from her Athens studio. 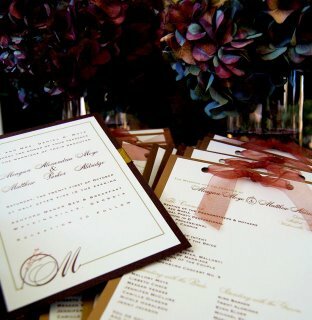 Kate's style is more modern than the usual black-cursive traditional work, although she does work with brides who are looking for something a little more sedate. But she shines at contemporary design, offering tailored save-the dates, invites and wedding thank-you notes with an organic feel, often with leaves, branches or another natural motif. She also creates monograms and will add on pieces like cute bar napkins if you ask. Here's why her approach feels so special: for one recent bride whose reception was in a lofty barn, Kate took a photo of the barn and converted it into a line drawing that was then added to all the wedding stationery. For another bride, she scanned a portion of her wedding dress and created a line drawing that was then interwoven into her invitations. But don't despair if you can't think of a meaningful motif—Kate has plenty of original ideas and a huge portfolio to help you find your unique style. She works by appointment out of her studio in Athens, and remember, everything is custom, so she'll need time with you to fine-tune her designs. We love that she works in a variety of styles, including letterpress, screen prints, relief block printing, offset and laser printing, as well as thermography—so you can work out something lovely at a variety of price points.